The Dawn Petal was a skyship on which Lucan stowed away in his flight from the Black Lantern. The adventurers were able to fight their way on board at the last moment, and then had to try and find the errant agent and his sister among the passengers. 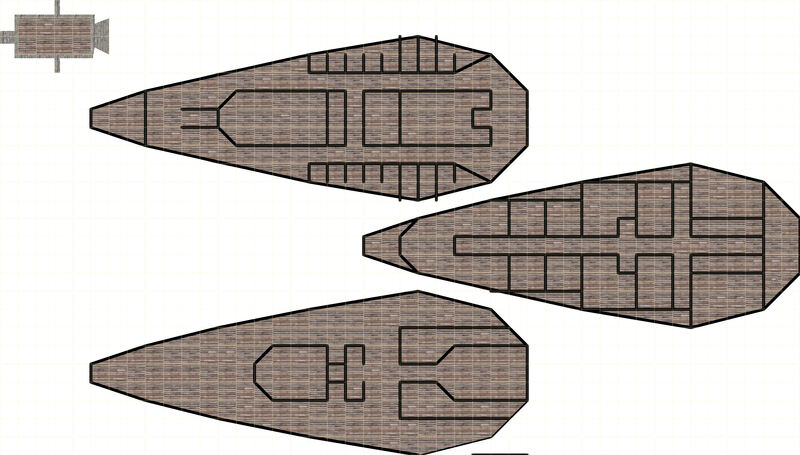 The small shape with the other floorplans represent the size of skiffs used to attack the ship. Of the three main deck plans, the topmost is the cargo hold and lockers, as well as the cage holding the fire elemental powering the ship. The middle deck contains cabins, crew quarters, kitchen and dining room. The top deck is open to the air, with the wheelhouse to the rear and a small card room. The Dawn Petal was destroyed when troops of the Emerald Claw crashed their airship into the ship in an effort to kill Lucan. The force of the collision broke the bonds holding the elementals in place, leaving both ships to plummet out of the clouds while the elementals fought it out above.